The one item in a retail store a business owner cannot do without is the cash management system. 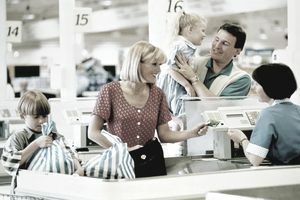 Whether it's the traditional, electronic cash register or an elaborate computerized point of sale (POS) system, every store needs a machine to process sales. One reason for the high initial expense involved with a cash register or point of sale system is that a business can expect to get many years of service from the first machine they buy. The life expectancy of a cash register is between 10-15 years, with upgrades around 5-7 years. What tax must your business collect on a sale? How many departments or categories that need tracking are in your store? How many products do you carry now? How many in the future? How busy will your store be? For a new business, the choice of a cash register or POS system may simply depend on the budget of the retailer. Don't pass the responsibility of selecting the cash register to employees or a consultant. Do your homework. Before selecting a cash register or POS system, understand your business needs, the cash management options and POS hardware available and make your selection based on an educated decision. One thing is clear, though, today's retailer requires the ability to run database marketing and that only comes from a POS system. By this, I mean the ability to capture customer information and purchase history. You need the ability to market to the person who is likely to buy and not everyone who ever bought from you. Before you buy either a cash register or a POS system, learn what kind of warranty or support comes with the machine. Plan how you or your staff will be trained to use the equipment. Once you make your purchase, stock up on any necessary supplies such as ink ribbons or receipt paper. Complete retail point of sale systems can run anywhere in the neighborhood of $1,500 to $20,000. The more POS hardware added to the system, the higher the cost. Retailers can find a simple cash register for under $200 but expect to pay between $250-800 for more advanced registers with scanners, display pole and other functions. It is fine to choose a low-end model to start with as long as you upgrade later, as the business grows. Look in your local paper for businesses closing their doors. A second-hand cash register or POS system will be much less expensive than a new one. If the business has recently closed, it may be a fairly newer model. Another option for cash-strapped start-up businesses is to lease a system from a business equipment supplier. Before you buy or lease a cash register or POS system, get the advice of an experienced professional before making your final decision. A bad choice could result in loss of sales or negative customer service. However, in the end, only you know what's right for your retail business.